I live four minutes from the Center, and that’s if I catch all the red lights along the way. 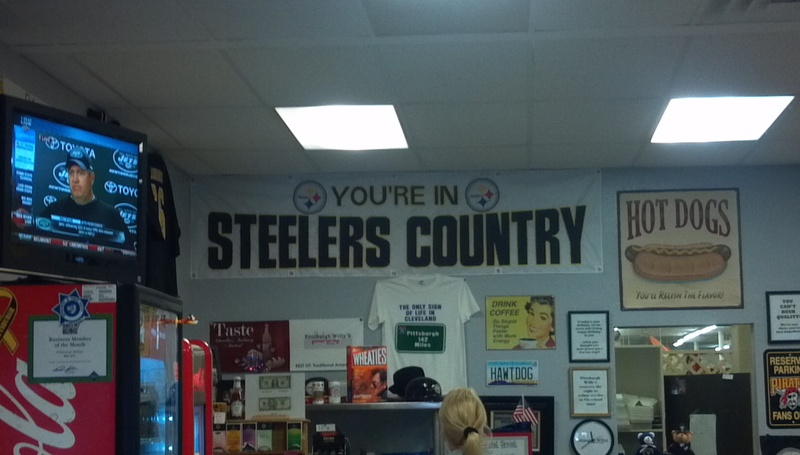 Right in the middle sits Pittsburgh Willy’s where you walk in and you’re not in Chandler anymore. Pittsburgh Willy’s owner Randy Walters is a Pittsburgh native who followed his highschool sweetheart to Arizona after time spent in the Navy, and didn’t start off serving hotdogs. He always wanted a restaurant like Pittsburgh Willy’s, but didn’t have the opportunity until 2005 when he lost his job at Chandler Regional Hospital. “I bought a hotdog cart and worked that, learned the business and in 2008 I opened this place (the restaurant), with no business experience, no restaurant experience. Just a desire and a dream,” he said. Whether you’re looking to try a new hot dog (all of which Randy created) or looking for a twist on a Pittsburgh staple like chipped ham, Pittsburgh Willy’s has the food you’re looking for. “Pittsburgh food is comfort food. We don’t count carbs, don’t count calories, and we use real ingredients, like real cream and real butter. It’s the food the way grandma used to make it,” said Randy. Because the community chose to support Randy, Randy is doing what he can to give back to that community. “I’m blessed to be one of the people who is living their passion,” he said. “My success is dependent on public support. They trust me enough to come in here and spend their money, so I give back to that community,” including the community arts center. “Each family is responsible for their home, and each home is responsible for their community, and to support that community. In a perfect world, everyone would do that and it would be a much better place,” he said. I couldn’t agree more, even though I’m not a Steelers fan. You can give Pittsburgh Willy’s a visit either in person, on their website or Faceboook. And try the chipped ham. That just sounds awesome.